In December of last year, Kid Cudi dropped his Passion, Pain & Demon Slayin' album to well-deserved acclaim. Like all of Kid Cudi's projects, it was a deeply personal album. Cudi himself was dealing with his own demons prior to it's release, leading him to check himself into a rehabilitation facility for depression and suicidal urges two months before it's release date. While this year Cudi has been winning and seemingly doing much better, many were hoping that he would be taking the album on the road. 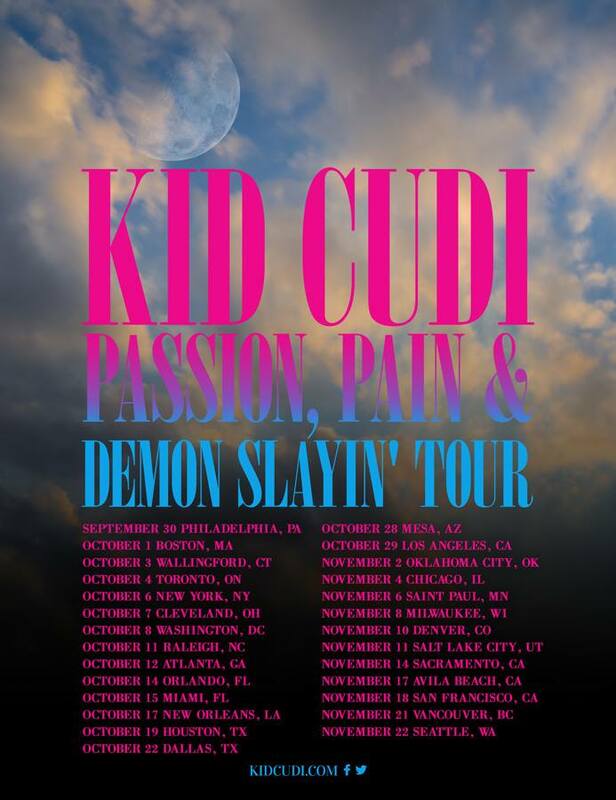 Cudi has now announced his "Passion, Pain and Demon Slayin'" North American tour dates for the fall. Last Friday, a short 10-second video on Kid Cudi's Facebook was posted that just said "Kid Cudi. Tuesday." leading many to speculate what it would be. Turns out it will be his headlining tour for the fall. Cudi will embark on a 27-date tour across North America, bringing his latest album with him. The tour starts in Philadelphia on September 30th before ending it in Seattle on November 22nd. He will also be making a pit stop in Canada for his Toronto date on October 4th before heading back to the U.S to continue the rest of the the "Passion, Pain & Demon Slayin'" tour. For anyone who has been eager to see Kid Cudi, he's definitely someone who takes his live shows just as serious as he does his artistic endeavors. It should be interesting to see how he translates the album onto a live stage. While he's been known for his music, Kid Cudi does have a theatrical background that he uses to his advantage for his live performance. Pushing the boundaries of a live show past music and into an experience as a whole. Just last week, he was seen with Kanye West and Takashi Murakami at the latter's studio in Japan which led many people to speculate that there's a chance West and Cudi may have something brewing in the vault. While there isn't anything confirmed that, Cudi is most likely going to be focusing on his upcoming tour which we hope will be followed up by more music.